Catalign Quarterly is an attempt to put together insights relevant for fostering a culture of innovation in organizations – both for-profit and not-for-profit. Through articles and interviews we explore principles, practices and policies that help organizations become more innovative. Theme for this quarterly is “8 steps to innovation – in action”. Since its release in March our book “8 steps to innovation: Going from jugaad to excellence” has gone places from corporates to Government departments. I and my co-author Prof. Rishikesha Krishnan were invited by several dozen organizations to (a) spread awareness of systematic innovation (b) assess innovation maturity and (c) help in action planning for the next steps in innovation journey. We know that these are early days for “8 steps” adoption. However, following articles give a glimpse of how “8 steps” was put into action. 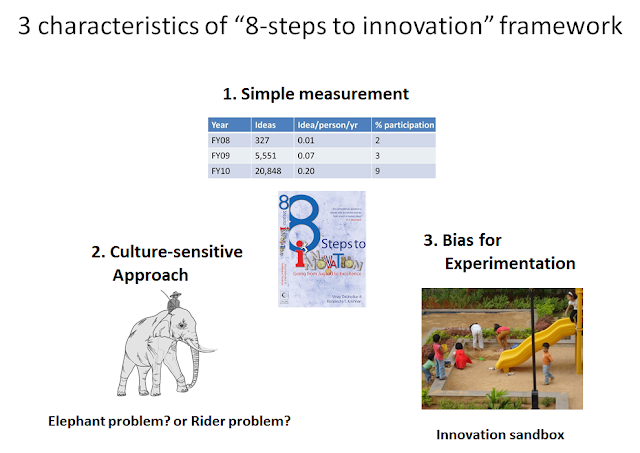 3 characteristics of “8 steps to innovation” framework: This article highlights the 3 characteristics of 8 steps approach – (1) simple measurement (2) culture sensitivity and (3) bias for experimentation. Building a challenge book (step-2): An example from an IIMB session: We believe that creating a challenge book for your team / organization is an important step in your innovation journey. In this article, I analyse a challenge book created in an IIMB session from three perspectives (1) emotional appeal (2) concrete goals and (3) hooks for imagination. Using navigation matrix in the innovation journey: “8-steps” approach provides a 3x3 matrix for action planning. One axis is “What to improve?” and the other axis is “How to sustain the change?” Depending upon what you want to improve and the nature of change, “8 steps” proposes several options. This articles presents a few scenarios and how the navigation matrix was used in creating a response. 5-level assessment framework based on 8 steps to innovation: In the past few months we got an opportunity to participate in the assessment of innovation maturity of several for-profit and Government departments. Some of these were informal or quick assessments. We believe over 70% of corporate and over 80% of Government departments in India are either at level-1 (Jugaad) or level-2 (Foundation) or somewhere in between. 3 things I liked in Richard Rumelt’s Good Strategy, Bad Strategy: In this article I present the three things I liked about this book: (1) Emphasis on identifying the challenge (2) the role of Proximate objectives and (3) Treating strategy as a hypothesis. Finally, I discuss some places where it intersects with 8-steps approach. Ericsson hired Gabriel Broner in March 2010 as Head of Innovation at the development unit IP & Broadband headquartered in Silicon Valley. The mandate was, “Please make 6,000 people across world more innovative”. 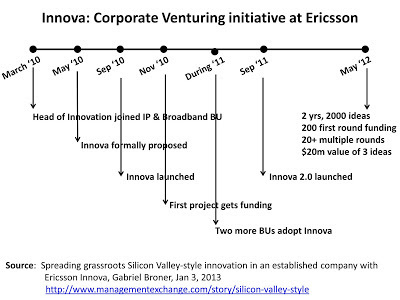 Broner narrates the story of the innovation program he has been running at Ericsson since September 2010 here. In two years, it has generated 2000 ideas, 200 of which got first round of funding and 20+ have got multiple rounds of funding. Top three in the pipeline promise an estimated $20 million in software revenue and productivity improvements representing greater than 5 ROI. Here are 4 things I liked about Innova. Explicit sponsorship: Many times idea contests give awards for the winners and the story pretty much ends with that. Innova does it differently. If your idea is selected you get $500 and a week off from your regular office time to work on your idea. In November 2010, two guys in Milan, Italy received the first VISA card with $500 and the experimentation week-off. You can’t do a whole lot with $500 and a week’s time. Or so we think. But Gmail prototype was built overnight. Similarly, 3-D model and a prototype print can happen in a week’s time. The idea in the initial stages is to have the crude idea take some shape. Explicit sponsorship can send a strong message to people around. Revenue or productivity impact: Growth is the primary driver for corporate venture programs. Hence, it is natural to have a bias for ideas that penetrate new markets or new products that delight existing customers. However, if you want more people to participate in such a program, you need to widen the scope of innovation. Far more people in the organization are internal facing and are likely to have ideas for productivity improvement than new product ideas. The story of Stefano and Paolo who got funding for their idea to improve simulation productivity by 10x tells that Innova included productivity improvement as part of its scope. Rewarding failures: During the experimentation week Stefano and Paolo in the earlier example didn’t achieve the expected 10x improvement. They could get only 2x. However, they were given Innova award for “Best experimentation Week” for what they learned and achieved. The duo went back to Milan after receiving the reward in Silicon Valley and quickly proposed a plan for a second round of funding. During the three months they spent, Stefano and Paolo exceeded their target in some cases. Simulations that would take 40 days were now done overnight. That is the power of rewarding failures & learnings. Methods & tools: Ericsson adopted Design Thinking as a methodology to promote methods and tools for innovation. DT emphasizes customer centricity and rapid experimentation. Whether it is DT or something else, it helps to provide coaching to teams in tackling their project / BU specific challenges. Many other organizations like P&G, Toyota, Cognizant, SAP Lab have integrated training programs with their innovation projects. I don’t believe that working on the side could lead to large impact innovations. Companies need to find way to create space & time for incubating ideas. 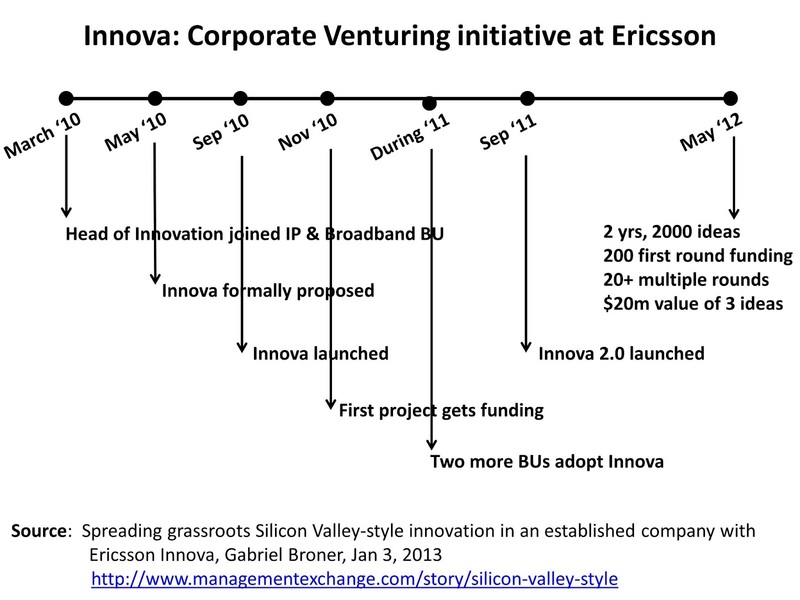 I hope programs like Innova inspire more companies. I appreciate Broner for sharing the insights through his article. Spreading grassroots Silicon Valley-style innovation in an establishedcompany with Ericsson Innova, Gabriel Broner, Jan 3, 2013. How is “8-steps to innovation” different from other approaches? This is a common question that we get asked. It is a valid question. After all there are so many books out there proposing their distinct approaches to innovation. Here is an attempt to present 3 characteristics of 8-steps approach. Simple measurement: The first thing 8-steps approach emphasizes is usage of simple measurement. A measurement that can be carried out in a team of five and also in an organization of one lakh employees. Measurement emphasis has enabled us to create a simple 5-level self-assessment framework. In the past two weeks since we shared the framework, we have already received inputs from more than two dozen managers. Some of them have been more open than others in sharing where they believe their organization stands. However, none of them has said, “I don’t understand it”. Whether it is pipeline, velocity, batting average, participation, number of experiments, we have proposed ways of measuring the progress. Culture-sensitive approach: 8 steps approach has nothing to prescribe unless some aspects of the context and culture are known. For example, you need to have clarity on what you want to improve. Is it idea pipeline, velocity or batting average? Similarly, you need to check whether the problem is primarily the Elephant problem or the Rider problem (lack of motivation or direction)? This article shows how this works. It is an iterative approach. In each iteration, you need to identify where one stands, what to improve and then design a robust intervention to improve the situation. Bias for experimentation: 8-steps approach highlights the importance of taking big bets. However, it assumes that big bets are likely to carry risks some of which can’t be resolved early in the lifecycle. In fact, we strongly believe that it is impossible to predict the success of big bets. Hence, it emphasizes rapid iteration ideally with low cost in validating the assumptions associated with ideas. For big bets it emphasizes building structures such as a sandbox that enable low-cost high-speed high-volume experimentation.